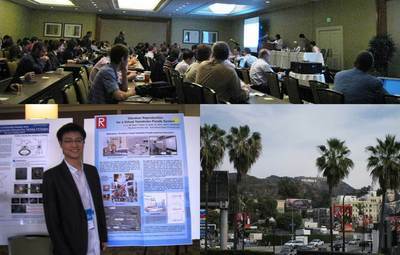 IEEE VR 2012 was held in Orange County, USA, March 6-8, 2012. I made an poster presentation and a fast-forward oral presentation titled "Vibration Reproduction for a Virtual Yamahoko Parade System". A lot of researchers interested in our research on digital museum that is an application of virtual reality to humanities. The conference featured keynote speeches such as "Taking the 'Virtual' Out of Virtual Reality" by Prof. Carlo H Sequin, "What's Next? : The Third Wave in Computer Graphics and Interactive Techniques" by Prof. David J Kasik, and "Isn't All Reality Really Virtual?" by Prof. James J Blascovich. L. Li, W. Choi, Y. Hara, K. Izuno, K. Yano, and K. Hachimura, “Vibration reproduction for a virtual Yamahoko Parade system,” IEEE Virtual Reality 2012 (IEEE VR 2012), Orange County, USA, pp. 129-130, 2012.